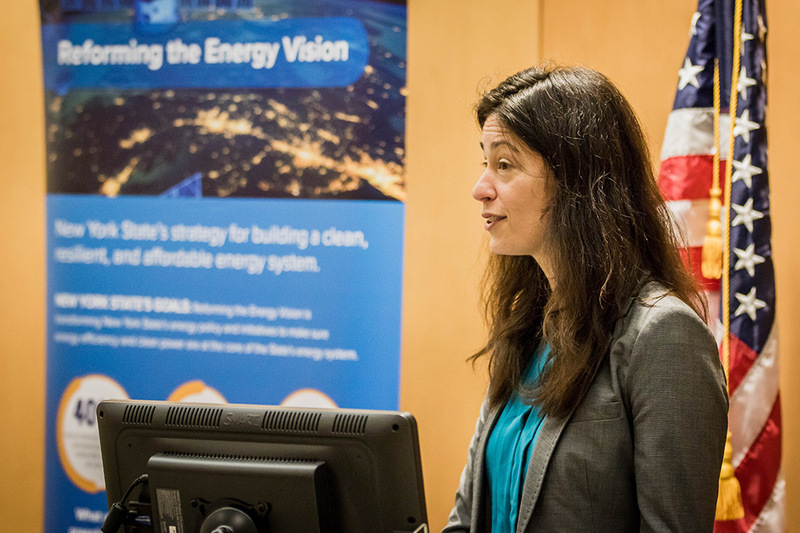 Enid Cardinal, senior sustainability adviser to the president, will serve as lead principal investigator on the Energy to Lead project. Rochester Institute of Technology has won $1 million as part of the Energy to Lead Competition, which challenges New York colleges and universities to develop plans for local clean energy projects on campus and in their communities as the state seeks innovative solutions to combat climate change. RIT will create a platform that integrates multiple data sources to enable a building’s existing automation system to manage operation schedules, adjust ventilation rates in classrooms and respond to peak demand days, according to Enid Cardinal, senior sustainability adviser to the president. Cardinal will serve as lead principal investigator on the project. The platform, once tested and deployed at RIT, will be tested at Monroe Community College’s downtown campus and then made publicly available free of charge for other institutions to leverage. The project is expected to result in the avoidance of 108 metric tons of greenhouse gas emissions annually. The Energy to Lead Competition, announced by Gov. Cuomo in 2015, is part of the REV Campus Challenge, which recognizes and supports colleges and universities across New York state that strive to meet their financial, environmental, academic and community goals through clean energy solutions. As a signatory of the American College and University Presidents Climate Commitment (ACUPCC) and member of the REV Campus Challenge, RIT has pledged to become carbon neutral by 2030. Applicant schools were required to submit projects which demonstrate innovation in one or more of the following areas: project design, business model, partnerships, and/or curriculum integration. Schools and universities were also required to describe the project’s impact on greenhouse gas emissions, how they would measure success and how they would use the funding to advance the project. These projects are expected to reduce greenhouse gas emissions by 2,125 metric tons over the next five years. The competition is administered by the New York State Energy Research and Development Authority (NYSERDA) and open to two- or four-year public or private colleges or universities. The competition challenges schools to develop ideas for innovative projects in energy efficiency, renewable energy or greenhouse gas emission reduction on campus, in the classroom and in surrounding communities. This round of Energy to Lead included 24 project submissions from 21 different public and private colleges and universities across the state. Applications were reviewed by an evaluation panel and winners were chosen based on project cost effectiveness, innovativeness, energy efficiency and clean energy measures, the impact on greenhouse gas emissions and how funding would be used to advance the project on campus and in the community. For more information on Energy to Lead, go to NYSERDA’s website.